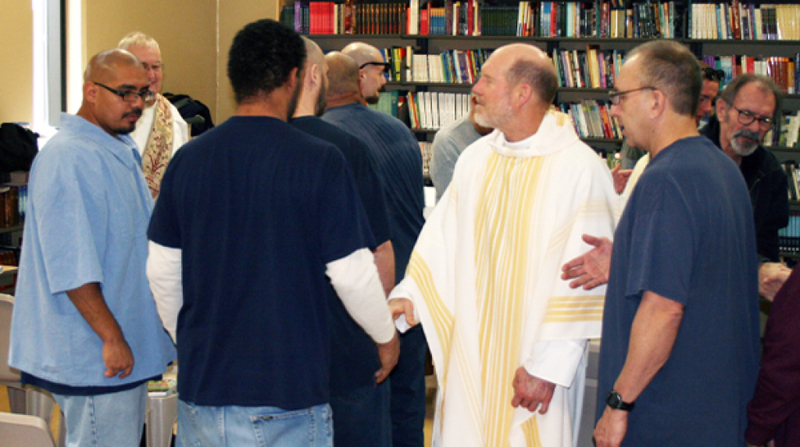 Holy Family Parish's Prison Ministry ministers to offenders at the Iowa State Prison in Fort Madison. Mass is celebrated at the prison once a month, with local priests offering the Mass. A Communion Service is also offered once a month by a Deacon Dave. There are approximately six parishioners who accompany Deacon Dave to the prison when they can. The parish occasionally asks for jigsaw puzzles to donate to the prison. During the first puzzle drive, an 18,000 piece puzzle was donated. It was packaged in four separate 4,500-piece bags. To pass security, however, the bags were opened and dumped together. Since the four bags had each been cut with the same cut template, four pieces could fit into one place. Offenders spent hours looking for the one piece that fit the picture. The offenders enjoyed the challenge of the hunt for just the right piece. To be a part of the Prison Ministry, please call Deacon Dave Sallen, 371-4050. You will need to be able to pass a screening and training through the prison system before you can begin ministering to the offenders.